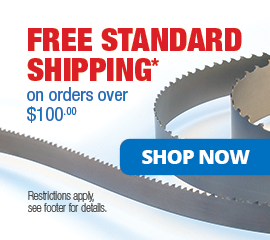 When you place your order at BandSawBladesDirect.com, we fabricate & weld your custom blades to order. PLEASE NOTE: If you need your order expedited, please be sure to choose an expedited shipping option during checkout. Our Lenox Factory-Certified welders are working tirelessly to build your blades to order as fast as they can. Orders are processed in the order in which they are received, however expedited shipments are moved to the front of the queue. We offer both a flat-rate and free shipping option (using standard UPS Ground for both) for the contiguous United States depending on the subtotal of your order (prior to any taxes and after any discounts) and the shipment destination. Please Note: Selecting and paying for UPS Ground during checkout is no different than selecting the promotional flat-rate or free shipping option; doing so will not expedite your order in any way as it will be shipped using the same UPS Ground service. Standard Free Shipping (UPS Ground) $100+ FREE! 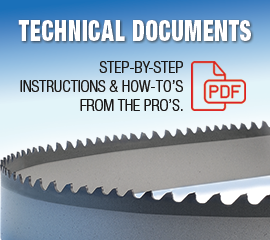 Sign up to receive technical documents for band saw blades, sharp tips, and periodic band saw blade promotions. Our Lenox Saw Service Center welds are Factory Certified. That means every blade matches factory quality standards. 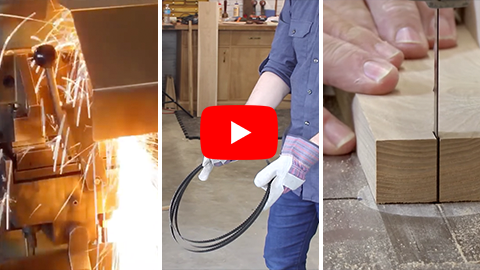 Watch how we fabricate your custom band saw blades, learn how to fold & unfold your blades, and eliminate drift from your band saw! New! Shipping charges applied to subtotal prior to any taxes and after any discounts. View all terms. 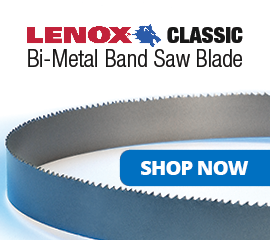 Easily find and order your custom LENOX band saw blades! Select a blade based on your application. Select length in feet, inches, & frac./in. Length In. INCHES 0" 1" 2" 3" 4" 5" 6" 7" 8" 9" 10" 11"
Length Frac. FRAC./IN. 0" 1/8" 1/4" 3/8" 1/2" 5/8" 3/4" 7/8"
Using this CALCULATOR, enter your measurement in total inches to easily convert it to ft./in./frac. of an inch. Example: Convert 150.5" to 12' 6" ½"
Select your desired width x thickness & teeth per inch. Enter your measurement in inches below to convert to ft./in./frac. in. Once converted, click USE RESULTS to transfer your measurement to the blade finder.